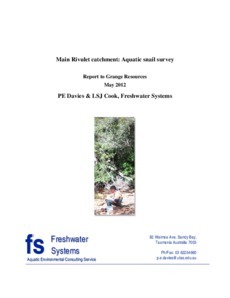 This report documents a survey conducted for the presence of aquatic snails in streams within the footprint of a dam on Main Rivulet proposed for the South Deposit Tailings Storage Facility by Grange Resources (Savage River Mine). The survey involved visits to several sites on tributaries of Main Rivulet both within and outside the proposed dam footprint in May 2012. Sites were initially proposed by a specialist nominated by the DPIPWE Threatened Species Section. The presence of snail species listed under current Tasmanian Threatened Species Protection Act (1995) was assessed.